This is what happens when I play in my kitchen. Hey there! Thanks for dropping by Munchie's Mind! Take a look around and grab the RSS feed to stay updated. See you around! 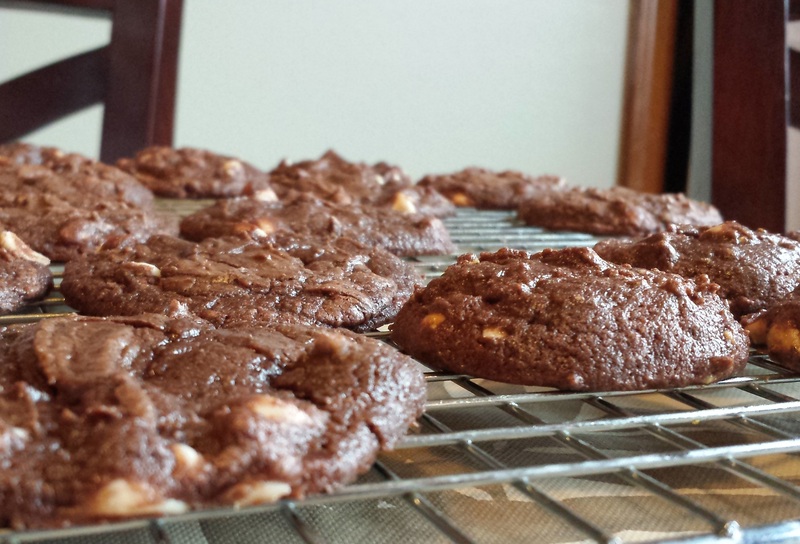 Cream Cheese Brownie Cookies ~ sugar free option too! I haven’t posted any sweets recipes lately. What is wrong with me?? Ha! Actually, I’m not baking as much as I used to. Instead, I’m trying new dinner recipes, which has been fun, but I still love my sugar! The sugar-free cookie (right) is slightly thicker than the regular version. I recently made these for a friend’s birthday and they disappeared off the platter in no time. Everyone LOVED them so I have to share! I made a nearly-sugar-free batch too, and my friend asked if I was sure they were sugar-free. I assured him they were, but don’t mistake them for a “diet” cookie. They are full fat! The batch I made was “nearly” sugar-free because I used regular peanut butter chips in them. You can make them sugar-free by using nuts instead of chips. It really depends on what you like and how much or little sugar you want. The original recipe used white chocolate chips in them, but use whichever chips or nuts you prefer. I love nuts in brownies, so I would add walnuts or pecans if I make a batch for me. And peanut butter chips? Always great with chocolate, right? I noticed the sugar-free batch didn’t spread as much as the regular batch; neither made a flat cookie. Both were chewy fudgy gooey fantastic! How could anything with cream cheese and butter be anything but?? Line baking sheet with parchment paper or baking liner and set aside. Using electric mixer, beat cream cheese and butter until smooth. Add in egg and continue mixing until incorporated. Turn mixer to low and add in brownie mix until dough comes together. It will be very thick. Stir in chips and/or nuts. Using large cookie scoop, scoop dough onto lined pan and bake for 10-12 minutes until edges are set. Let cool a couple minutes on the pan and then transfer to wire rack to cool.